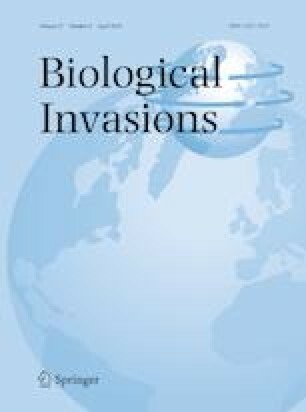 Predicting the spread of invasive species in a warming world calls for a better understanding of the mechanisms behind the relative performance of both invasive and indigenous species as recipient communities can offer biotic resistance. A particularly important functional trait in this context is reproductive potential. The Mediterranean mussel Mytilus galloprovincialis is invasive world-wide and threatens the native brown mussel Perna perna on South African rocky shores. Where they co-exist, Mytilus dominates the high and Perna the low mussel zone, overlapping in the middle. Mytilus generally exhibits high individual reproductive output, but feeding time is reduced, physical conditions are stressful and adult densities are lower on the higher shore. We compared overall reproductive potential of populations of the two species using a 1-year data set for three sites, accounting for within-shore distribution and abundances. Despite the restriction of Mytilus to the more stressful upper-shore, its aggregate reproductive potential was comparable to that of Perna. We then used Dynamic Energy Budget modelling to test the effects of changing conditions by calculating aggregate reproductive potential under temperature conditions predicted for the end of the century by the International Panel on Climate Change. The results suggest increased aggregate reproductive potential for both species, but the effect was stronger for the native species at two of three sites, implying increased biotic resistance by Perna to the further spread of Mytilus. Combining ecological context and physiological performance elucidates how interactions between native and invasive species may alter. Such nuances are fundamental to anticipating winners or losers in a world where distribution shifts are increasingly common. The online version of this article ( https://doi.org/10.1007/s10530-019-01990-2) contains supplementary material, which is available to authorized users. This research was funded by the South African Research Chairs Initiative of the Department of Science and Technology and the National Research Foundation to CDM. CJM was supported by a Rhodes University post-doctoral fellowship. We are grateful to Carlota Fernández-Muñiz, Aldwin Ndhlovu, Diane Smith, and Jaqui Trassierra for assistance during laboratory and field work.